Our week-long visit in Portland CT now concluded, we are moving slowly down the eastern seaboard again. Today’s tow was one of our shortest ever, at just about 50 miles to an apple orchard in Bethel CT.
We really didn’t have any compelling reason to move on. Portland and Middletown were very pleasant to visit, and our spot by the river was peaceful. But our pre-paid week was up and so we decided to keep moving. It feels like Fall every day now, with cool nights into the upper 40s, lots of poofy clouds breezing by, and the first hints of leaves changing color. If we wait much longer, we’ll be running the furnace quite a lot at night. Already we’ve packed away the summer shorts and pulled out the long pants and sweatshirts. There was one necessary stop before we departed Portland. The marina campground lacks an RV dump station, and so they direct customers to the nearby municipal water treatment plant. These are always interesting spots to dump tanks, because (a) they generally aren’t set up for easy RV access; and (b) because they usually just point you to an open grate that feeds into the treatment plant, and say, “Just dump it there.” This makes for an extremely graphic experience. I would rate it “R” for those who are squeamish. We picked Bethel CT as our stopping point today because we didn’t get enough time to chat with our friends Rick and Sandi during dinner last Friday, and we wanted to get our apple-picking in before we left New England. I found an orchard by searching online, and verified from Google Maps satellite images that there was plenty of room for the Airstream. 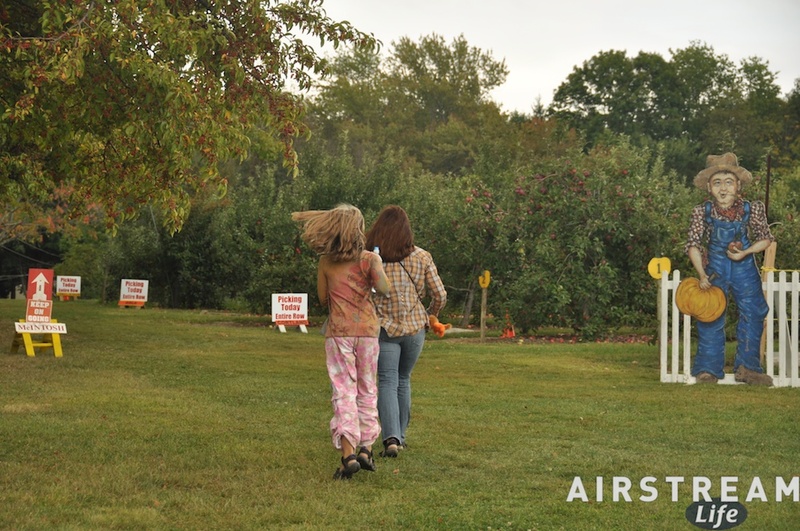 The idea was to spend a few hours at the orchard and then relocate to the local Wal-Mart for overnight parking, but Rick happened to know the owners of the orchard, and the next thing we knew we were welcome to spend the night. I’d much rather spend the night surrounded by apple trees than surrounded by asphalt. 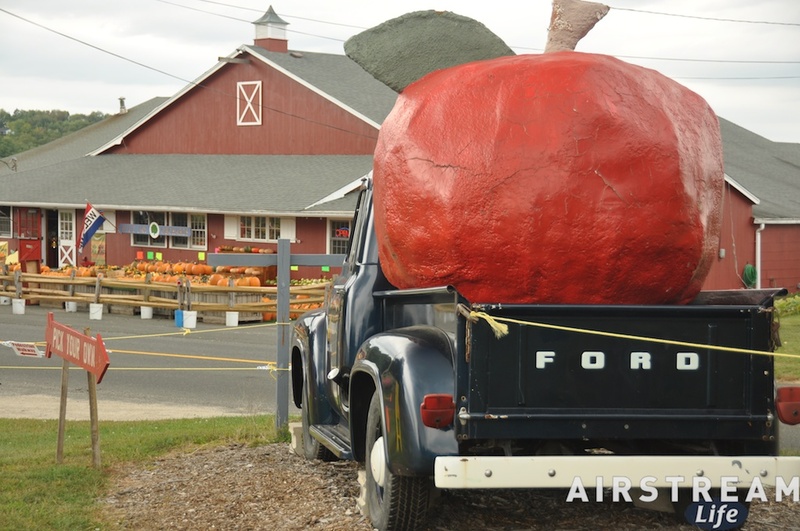 A tradition of fall in the northeast is apple-picking season. We have done this for decades, and since Emma was added to our apple-picking clan, we’ve tried to take her as often as possible. 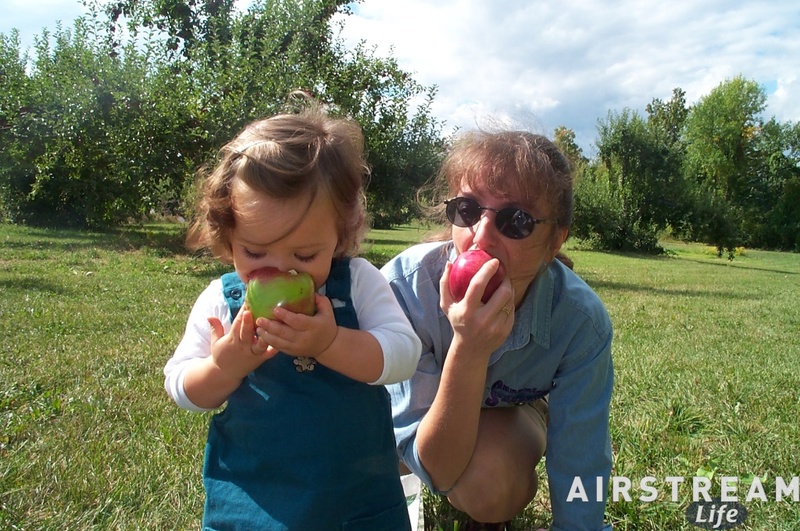 The picture at left is from 2001, up in Vermont, where orchards are abundant. The photo at right is an updated version from today, nine years later, at our current location. They’re picking Galas and Cortlands right now, but the varieties of apples changes rapidly through the season. Cortlands are good for eating and for baking, and that’s what Eleanor wanted. Galas are sweeter and very nice for eating. Inside the store we also found some really wonderful cider donuts and fresh cider, so we are loaded with apple stuff now and feeling very good about the season. So here we are, parked on high ground and having a very pleasant apple-filled afternoon. Tonight we’ll see Rick & Sandi again, and then head out early for a drive past the NY/NJ metro area, down to Philadelphia. Our positioning here in Bethel is not just convenient, but strategic. We are comfortably esconced outside the madness of the metro traffic, yet poised at the very edge, so we’ll be ready to tackle the traffic first thing tomorrow. Seeing that old Ford truck brought back the memories of our old one that we used for years. We would love to have another just like it! BTW, Rich, what camera did you use to get the panorama? Dave, the panorama was taken with my usual Nikon D90 and Nikkor 18-200mm lens (set at 22mm) and then simply cropped. The resulting image is 4257 × 1071 pixels (4.6 megapixels).